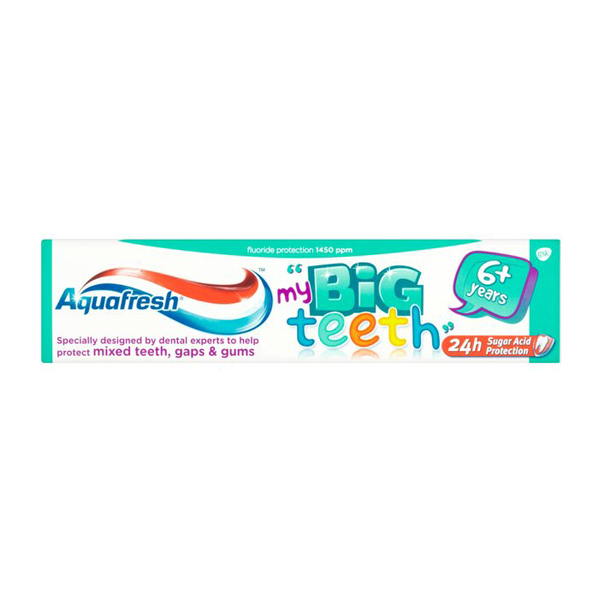 Aquafresh Big Teeth toothpaste has a red, white and green stripe especially for children aged 6+ years, to strengthen teeth, freshen breath and protect teeth, gaps and gums. Lovely minty taste encourages use and is a great final step to a grown up toothpaste. Contains: Sodium Fluoride 0.306% w/w (1400 ppm fluoride). Aqua, Hydrated Silica, Sorbitol, Glycerin, PEG 6, Sodium Lauryl Sulfate, Aroma, Xanthan Gum, Titanium Dioxide, Carrageenan, Sodium Fluoride, Sodium Saccharin, Limonene, CI 74260, CI 74160, CI 73360.